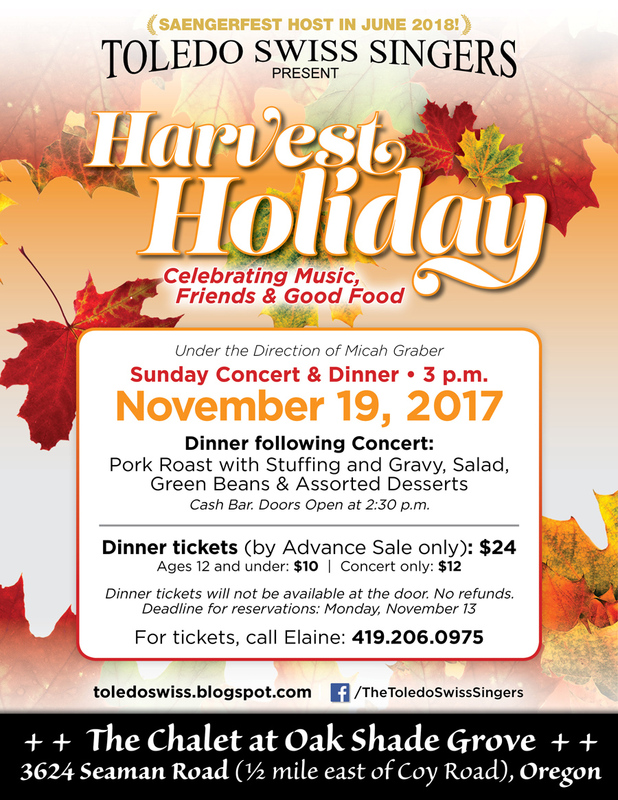 The Toledo Swiss Singers, one of the area’s oldest singing groups, will open the 2017-2018 season at their fall concert Nov. 19 with a celebration of music, friends and good food, ahead of Thanksgiving. 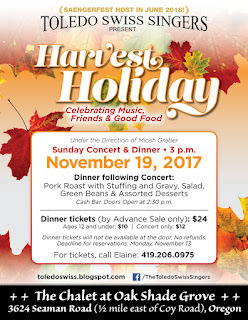 The concert, titled “Harvest Holiday,” will feature friendly and familiar songs, along with traditional Swiss songs. The special Sunday afternoon concert begins at 3 p.m. with a pork roast dinner served following the performance at The Chalet at Oak Shade Grove, 3624 Seaman Road in Oregon. Concert and Dinner tickets are $24, with $10 tickets for children 12 and under. The deadline for reservations is Monday, Nov. 13, with only concert tickets available at the door. For tickets, call Elaine at (419) 206-0975. For the 2017-2018 season, the Singers will present “Murder under the Big Top,” their fourth annual dinner-theatre mystery event, on Saturday, Feb. 24 and Sunday, Feb. 25. The group will close the season with its spring concert on Sunday, May 6. The end of the season also marks the culmination of three years of preparations for the Singers with Saengerfest 2018, an international Swiss singing and yodel festival that the singers are hosting in Toledo in June. The Singers are part of North American Swiss Singing Alliance (NASSA), made up of 14 choirs from Canada and the U.S. They compete internationally every three years; the most recent competition was held in June 2015 in New Glarus, Wis., where the group was awarded gold and silver prizes. The next competition will be held in June 2018 in Toledo. Learn more about Saengerfest by visiting the official website.